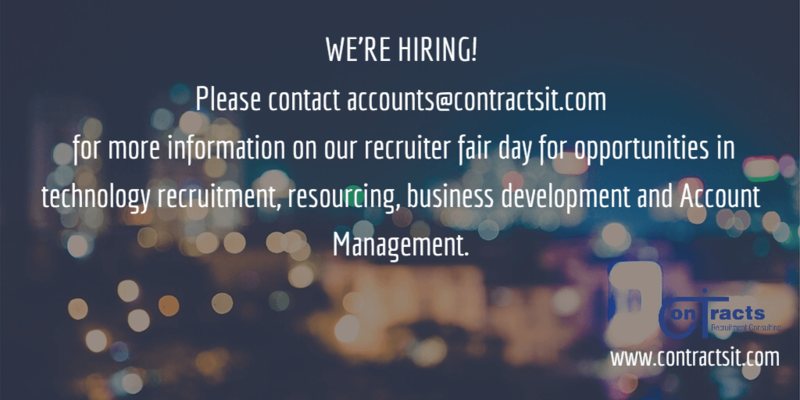 06 Sep We’re hiring across the Recruitment Spectrum! We have some exciting career opportunities for consultants who wish to work for a company with a difference. We’re looking for business development consultants, experienced recruiters, resource consultants and entry level research / marketing consultants. Experience of Diversity recruiting or someone looking for training in this area would be great. This is a permanent position where we will consider flexible working. We are also looking to provide internships and apprenticeships for the right candidates looking to progress within international recruitment and sales. We are also looking for senior consultants with expertise in the following areas to lead and grow teams in . Establised in 1999 Contracts IT Recruitment Consulting is an Award winning IT Recruitment Agency based in London with global reach. We are looking for our next cohort of recruiters to join our existing team with opportunities to work on International client accounts . You will join the Contract & Permanent IT Recruitment teams Markets. We are expanding into new areas , sectors and further extending our reach into existing markets. We are seeking talent acquisition consultants to be located in London for the global markets and are offering a range of hybrid roles of managing existing relationships, whilst developing new business opportunities. You will have good interpersonal and communication skills in English where any other European language would be an advantage, but not essential. An entrepreneurial mind set & proactive approach towards professional and personal development are required and we’d be keen to speak and explore your ideas of growing a new desk. You will work in a supportive, friendly and hard-working team of existing recruitment Consultants, learning and adapting your own style. We’re keen to embrace difference so apply whoever you are!